April 14 at 10:30 a.m.
For those interested in obtaining a digital copy of the Order of Service, look for the QR code poster as you enter the Sanctuary, on the bulletin board or scan from the cover of a neighbors printed copy. 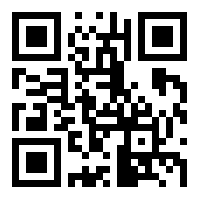 The dynamic QR code remains the same from week to week and is updated by 4pm on the Friday prior to Sunday Service with the latest Order of Service. Rev. Tim will be back in the office on April 15th. Janise Barajas-Rennie, our new Director of Lifespan Learning and Family Ministry, will begin in the office on April 15th. We’ll formally say goodbye to Katie during our Easter Sunday Service on April 21 at 10:30 am, and Katie will then introduce Janise Barajas-Rennie to the congregation and “pass the torch” of leadership to her. 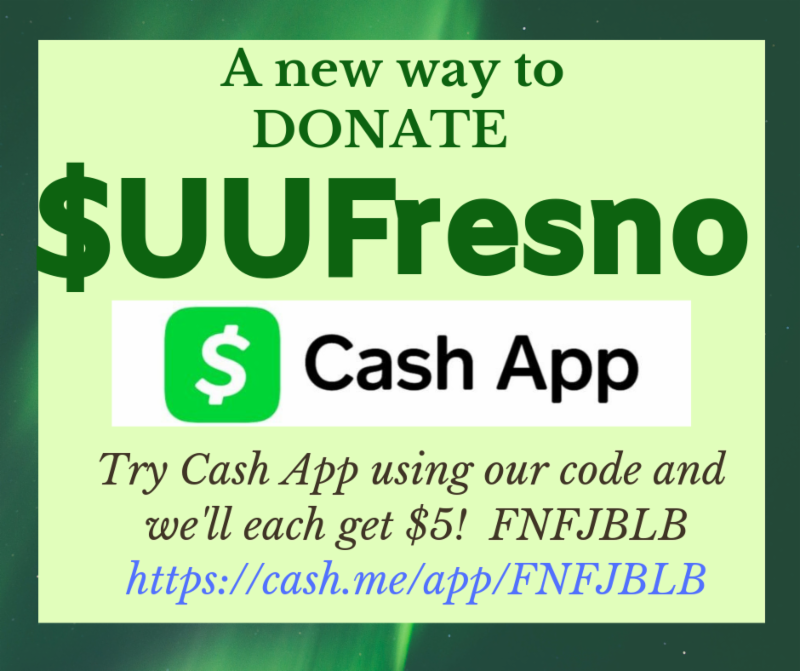 Cash App is a convenient way to send money to Unitarian Universalist Church of Fresno right from your phone. Please be sure to note what your donation is for, ex. Plate donation, 18-19 Pledge, Chalice Camp Tuition, etc. Katie Hyman's Farewell Ice-Cream Sundae Party immediately following Sunday Service on April 14 . Everyone is welcome to join in and wish Katie well while enjoying an ice-cream sundae. We look forward to seeing everyone there! Come join lively and interesting discussions with UU Seniors. Our next meeting will be on Tuesday, April 16 at 10:00 am in the Sanctuary. Judy Kuipers will lead a discussion on "Aging Well with Joy, Dignity,and Respect”. Refreshments will be provided. If you would like to receive monthly emails about UU Seniors, please contact Gail West at (559)284-5453 or email at leftwest@yahoo.com . Circle Suppers - and often brunches - are a great way to get to know your fellow UUs. These meals are typically held the 4th Saturday of the month, excluding November, December and summer months. This month's meal will be on Saturday, April 27. If you'd like to be part of this group, please call Gail West at (559) 284-5453. Tea and a Tour. Join Member Services Coordinator Patty Bennett this Sunday, April 14 , for an informal opportunity to learn more about our church. Meet in front of the pulpit for a brief tour of the church campus followed by conversation over a cup of tea (or coffee). Patty Bennett, msc@uufresno.org . Positive Discipline workshop -- Sat, Apr 27, 12:30-3:30pm. Learn the underlying motivations of children’s behavior and the role we play in influencing that behavior. Have fun while learning new tools to build your child’s self-esteem, self discipline, problem-solving and essential life skills. Facilitated by Certified Positive Discipline Parent Educator Alisha Mancinas. Minimum registration 6; maximum 20. Childcare available upon request. Register at uufresno.org/home/adult-re. Contact Alisha with questions -- fgz4life@gmail.com . UU Humanists – Sunday April 21, Youth Room. Final Exit Network. Pros and some cons of legal suicide. What should be the legal limits? Presented by Barbara Ulman and Toni Eames. Potluck at noon, come with or without food. Discussion at 12:30. Contact Devin Carroll, devinc@sbcglobal.net , 559-240-5127. Life Craft: A Unitarian Universalist Perspective on the Meaning of Life course -- Tuesdays, April 30, May 7, 14, & 21, 10am-12noon OR 7-9pm. How can we discover meaning in the shapes our lives have taken? How does our Unitarian Universalist faith inform the way we understand our life journey? Join Rev. Tim to explore the skill and the art of making meaning in our daily lives and also have fun in the process! Suggested text: the short and engaging Lifecraft: The Art of Meaning in the Everyday by Forrest Church, available through our church bookstore or online. Book not required to find meaning in class. Childcare provided upon request. Registration required at www.uufresno.org/home/adult-re . Contact Katie Hymans at khymans@uufresno.org with questions. Introduction to Unitarian Universalism: Saturday, May 11, at 8:30 am (breakfast included).Would you like to learn more about Unitarian Universalist beliefs? Do you have questions about what it means to be a Unitarian Universalist? Join Rev. Tim and Member Services Coordinator Patty Bennett for this engaging introduction to our faith and this church. To register and/or request childcare, contact Patty at msc@uufresno.org or 559-322-6146, ext. 15. The Second Sunday Social Justice collection will be received on April 14 by the Citizens Climate Lobby Fresno whose mission is to "remedy and mitigate global warming/climate change and to take action by participating in the growing environmental/climate justice movement.” Checks made out to UUCF with CCL in the memo line. vev40@comcast.net or Connie Young. Kay Twombly's mother died on the morning of Sunday, March 31. Cards and notes can be sent to Kay at 1247 E. Foxhill Drive, #141, Fresno CA 93720. Because of donors to the church’s Endowment Fund, we’ve accumulated interest earnings which we use when needed for special one-time uses. Recently, we have borrowed income funds from the Endowment for the additional modular building. So thank you, donors to the Endowment Fund! If you are interested in learning more about Legacy and Gifts, contact Kathy Huber, Facilities and Finance Manager at 559-322-6146 or operations@uufresno.org .